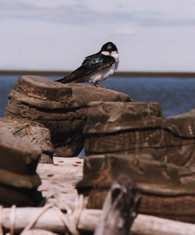 A compendium of research techniques, data collection protocols, and guidelines for the timing of data collection at all Golondrinas sites, based on long-term studies of Tree Swallows in Ithaca. To see a good example of field notation, or to download as a template for use, click here. Newly developed protocols to test hypotheses regarding geographic variation in clutch size at all possible Golondrinas sites. After downloading and unzipping, this software can be copied to the main (c:) drive and then explored for newgolondrinas.exe (the actual data entry program). Be sure to look at the readme.txt file, and see directions for Database Use. A detailed description of the databases that are maintained at Cornell, and the minimum set of data that must be collected at every Golondrinas Site, every breeding season. Construction plans and material suggestions for nestboxes used at Golondrinas sites. Design for construction of a simple nestbox trap used for capturing adult swallows. Schematic design and description of the standard insect sampling unit to be used at as many Golondrinas study sites as possible. This material is based upon work supported by the National Science Foundation under Grant Nos. OISE-0730180, DEB-0717021 and IOS-0744753. Any opinions, findings and conclusions or recomendations expressed in this material are those of the author(s) and do not necessarily reflect the views of the National Science Foundation (NSF).